Just ninety minutes of massive CGI monsters and “epic” battles. The old gods, Zeus and Hades find their powers and influence waning as mortals cease their prayers, and in a desperate act Hades opens the Underworld prison of Tartarus, freeing the titans and their ancient father Kronos. Now every immortal and demigod must choose a side, and Perseus must fight for the mortal life he chose. 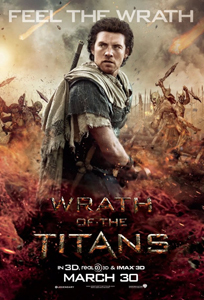 All this talk of titans being released might remind you of last years Immortals, and there are plenty of similarities (except for Mikey Rourke in a silly hat) only Wrath feels slightly more in keeping with the mythology. Slightly. I was a little saddened how the titans themselves were still underdeveloped or non-existent, the promotional images for Wrath suggested more diversity between them, yet most focus was given to the colossal Kronos battle. Cinematography used that irritating shaky camera once more, making the Minotaur fight a particularly lukewarm experience! The story’s surprise focus on Perseus’ brother Ares, yes, the God of War, was gratifying and hammered home (no pun intended) the concept of mortal prayers empowering and weakening certain gods. It almost felt like there was underlying subtext at this point! I could have used twenty minutes more though, to solidify some of the characters further and make it less like one long action sequence. Watching it beside Clash of the Titans might improve this however.